​Gray mold of tomato is one of the more common diseases of greenhouse-produced tomatoes. Although it is often a minor problem, if left unchecked, gray mold can cause yield loss. Gray mold, or more properly, Botrytis gray mold, often causes a light gray or brown necrotic lesion on leaves (Figure 1). The lesions on leaves are sometimes wedge shaped on the margin of the leaf. Stem lesions are a similar color and may encircle the stem, causing the death of the upper portion of the stem. Occasionally, gray mold may cause the rot of tomato fruit. Whether on leafs, stems or fruit, the gray fungal sporulation is often easily seen, thus the name. 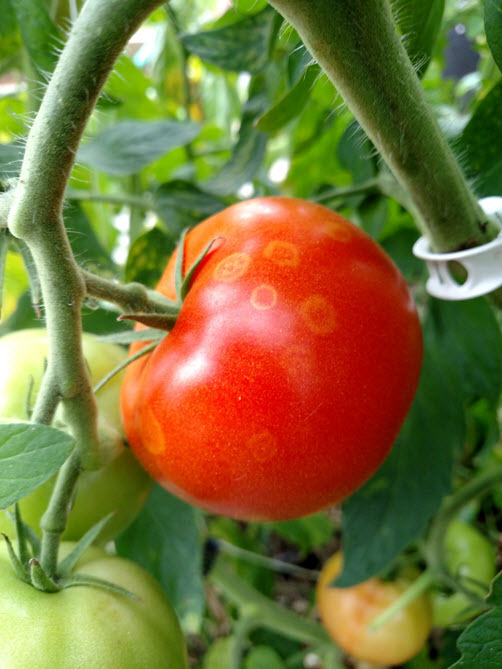 It is a rare symptom, but when fungal spores land on tomato fruit that is wet, the spores may germinate, causing a symptom known as a ghost spot (Figure 2). 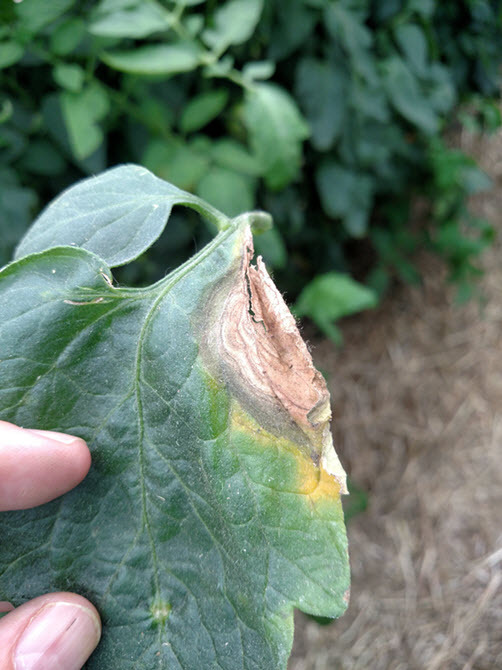 Botrytis gray mold can cause disease on many different host plants, enabling the fungus to easily survive and disperse between tomato crops. Host crops include flowers such as geraniums as well as other vegetables such as green beans. The disease is favored by relatively cool temperatures and high humidity which explains why the disease is often observed in greenhouses. Any cultural practice that lessens humidity such as pruning, will lessen the severity of gray mold. Since gray mold favors older plant tissue, pruning old leafs should reduce susceptible plant tissue. As a general rule, indeterminate tomatoes should be left with no more than eighteen to twenty fully mature leafs after pruning. Determinant (staked) tomatoes are often pruned until the first flower cluster, improving airflow and encouraging larger fruit. Another practice that may reduce airflow is spacing plants too close together. Practicing crop rotation may reduce the amount of the gray mold fungus that survives in a greenhouse. If crop rotation is not possible, remove as much of the crop as possible far away from production when the season is complete. Clean and sanitize the greenhouse between tomato crops. Use of a ground covering between rows of tomatoes may help to reduce the amount of crop residue that becomes incorporated in the soil. Several fungicides that may help to manage gray mold are listed in the Midwest Vegetable Production Guide. Products that should be effective against gray mold and are allowed for greenhouse/high tunnel use in Indiana include: Botran®, Fontelis®, Scala® and Switch®. Products that contain the active ingredient mancozeb may be less effective than those listed above, but these products may be less expensive and are readily available. Organic producers should look for products that contain formulations of copper. This article was original published on the veggiediseaseblog.org on July 23, 2015. Leaf lesions of Botrytis gray mold. Ghost spots may also be casued by gray mold.